Introduction: Amruthapura town is located in Tarikere taluk of the Chickmagalur district of Karnataka. This otherwise ordinary town, is famous for its splendid Amruteshvara Temple. The history of the town can be traced back to the Hoysala period when this splendid temple was set up here. 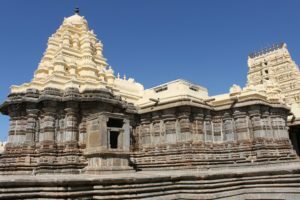 Unfortunately, the history before the Hoysala period is not known, but of course the town would be existing as an ordinary village from quite some time before the advent of the Hoysalas. By the time of the Hoysala king Ballala II, the town gained some importance, probably being patronized under the Amrita-dandanayaka, who was a general in the army of the Hoysala king. He caused the Amrutesvara temple to be constructed and set up a Brahmapuri of 24 Brahman families around the temple. After the Hoysalas, the town again lost the relevance as we do not find many references or inscriptions after that period. Amruthapura is also famous for a stone stele engraved with an inscription composed by the celebrated thirteenth century Kannada poet Janna. Janna was a court poet of the Hoysala king Ballala II and earned the title of ‘kavichakravarti’. Yashodhara Charite, Ananthnatha Purana and Anubhava Mukura are among is famous works. On a second stone from south in the Amritesvara Temple – No 45 of Tarikere in Epigraphia Carnatica vol VI – refers to the reign of the Hoysala king Veera Ballala II – dated 1196 CE – Victorious is Shiva sasana. Amita is hailed as the chief of generals. Genealogy of the Hoysalas is provided starting from Vishnu and moving to Brahma, Atri, Soma, Nrisimha, Budha, Pururava, Ayu, Nahusha, Yayati. Several generations after Yayati was born Yadu and from his greatness the Soma-vamsha acquired name of Yadava-vamsa. In this Yadava race was born Sala. Story of Sala slaying tiger is mentioned. This story took place at Sasaka-pura while Sala was worshipping goddess Vasantika. Since this event the race is known with name Poysala. It is also mentioned that Ballala II drove back the Malava emperor Jagadeva in a battle. His son Narasimha defeated the Pandyas as a result the Tungabhadra was choked with corpses of the latter’s great army. It is also told that Ballala erected many temples and the numbers are compared to be larger than the stars in the sky. Ballala is said to have returned from his successful north expedition and was at his residence at Hallavur otherwise called Vijaya-samudram. Genealogy of Amita is provided. He is said to have erected a tank at Belvala and Gaduge and a splendid temple of Amritesvara in Amrita-samudra. Amritesvara-dandanayaka set up god Amritesvara, on the specified date, in the presence of god Vajresvara, washing his feet with pouring of water received it from the hands of vira-Ballala-deva. He also made grants for decoration, illumination, for priests and servants and for food offerings to brahmanas. Various other people also made grants on this occasion. The text was composed by poet Jannayya. It was written by Nakanna, who was a disciple of Lokkigundi Mahadevanna and engraved by the sculptor Malloja. On a stone to north of inner door the Amrittesvara Temple – No 42 of Tarikere in Epigraphia Carnatica vol VI – refers to the reign of the Hoysala king Veera Ballala II – dated 1206 CE – Usual genealogy of Hoysala rulers till Ballala is provided. It is told that when Bittiga appeared on the battlefield, Kanchi, Kongu, Virata-kote, Koyatur, Chakragotta & Seven Konakanas cast away their weapons. Further mentioned that the Cholas, the Simhalas and the Seunas were made to hide their heads in their bodies by Bittiga. Maha-samanta-chudamani Naga-Gavunda, a servant of the king, together with his sons and relatives, for the decorations, illuminations and temple repairs of the god Amritesvara set up by Amiteya-dandanayaka, made a grant free from all imposts. On a stone to the south of the Amritesvara Temple – No 43 of Tarikere in Epigraphia Carnatica vol VI – dated about 1210 CE – This inscription limits the no 42 above. It is said that the guadike umbali of Amiteya-dandanayaka is Amritapura, together with the garden, was 5 mattas of rice-land by Ganga Pole. It was told that whoever plants areca-nut trees in this land, has to pay taxes to the god. A Brahmapuri of 24 was setup at the time of setting up god Amritesvara. On the first virakal in the Amritesvara Temple – No 46 of Tarikere in Epigraphia Carnatica vol VI – dated about 1214 CE – On the specified date, Khana Basaveya-dannayaka’s son Amiteya-dannayaka fencing with dwarfs (gujjuru) in the brick street in Dorasamudra, went to world of gods. On the second virakal in the Amritesvara Temple – No 47 of Tarikere in Epigraphia Carnatica vol VI – dated about 1214 CE – On the specified date, Kameya-dannayaka’s son Melayya fencing with dwarfs (gujjuru) in the brick street in Dorasamudra, went to world of gods. On a virakal on the south of the Amritesvara Temple – No 48 of Tarikere in Epigraphia Carnatica vol VI – dated 1287 CE – On the date specified, Kambi Suri-Gauda’s son Naganna, when Bedars seized the cattle of Amritapura, fought and gained the world of gods. On a virakal on the east of the Amritesvara Temple – No 49 of Tarikere in Epigraphia Carnatica vol VI – dated 1287 CE – On the date specified, Son of Mara, the washer-man of the town gained the world of gods. The headmen and chiefs being pleased, granted lands to him rent free. On a stone in front of Basava Temple – No 41 of Tarikere in Epigraphia Carnatica vol VI – refers to the reign of the Tuluva king Sadasiva Raya – dated 1547 CE – On the specified date, to accrue merit, Tirupati Ramaraja-ayya, who was agent for the affairs of the king Sadasiva-raya, made a grant of lands for the perpetual lamp to god Amritesvara. On the same stone as of No 43 – No 44 of Tarikere in Epigraphia Carnatica vol VI – dated about 1547 CE – Ali-khan sahib having come and inquired into the former matters, granted the lands to this village. The gaudas and senabova also came, and set up the boundary stones. Amruteshvara Temple – This exquisite temple consists of a garbha-grha (sanctum), sukanasi (vestibule), navaranga (dance hall) with a porch on its southern side and mukha-mandapa (main hall) with entrances on its three sides. 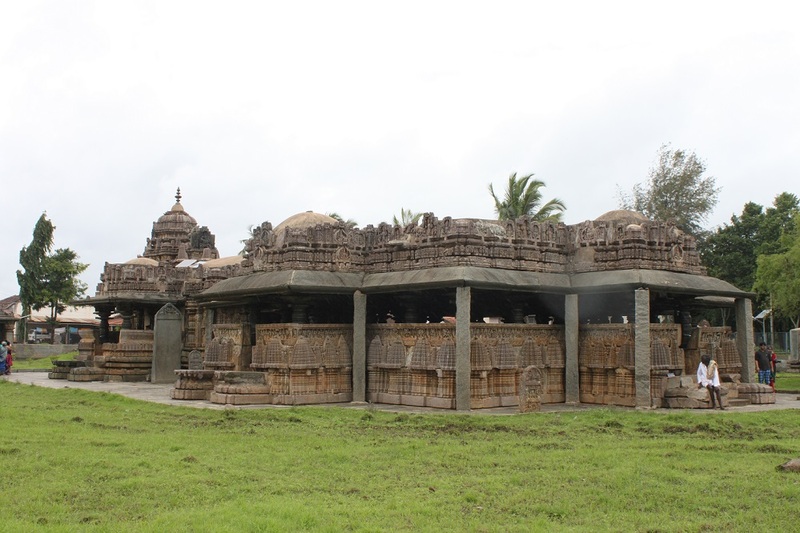 Though there is a possibility that the mukha-mandapa was constructed some time later than the temple, however all the structures are in Hoysala style and workmanship. The mukha-mandapa has twenty-nine bays in total, twenty-five equal bays in the hall, and four additional bays projecting out on each side. A unique feature of this mukha-mandapa is its more than hundred miniature temple towers carved on its parapet wall. These models are carved in big and small sizes in alternate fashion. These are supported on pilasters arranged in star design. Few turrets show curvilinear rising which indeed is peculiar as such a design is not frequently seen in Hoysala temples. The upper part of the railing is slanted inside at an angle and consists of bands displaying various Puranic stories. The south side railing displays various scenes from Ramayana. In total there are about seventy-five panels depicting various scenes from Ramayana. The story starts with the Putrakameshti yajna of Dasharatha and ends with Sita’s reunion with Rama and Lakshmana. To the right of the north entrance, we find twenty-five panels related to Krishna stories as depicted in Bhagavata Purana and rest forty-five panels depicts early events of Mahabharata. The panels of Krishna-lilas start with his birth in Kamsa’s prison and ends with end of Kamsa in the hands of Krishna. Mahabharata panels do not convey the full story. It starts with Kunti seeking help from Bhishma to protect her children. The panels end with Arjuna being granted Pashupata in the hands of Shiva. In between are displayed various events. Some scenes are seen for the first time in the Indian art. The good thing about these panels is that these are larger than the regular panels found in the Hoysala scheme. The regular place of these Puranic stories panels is in the middle of the multiple horizontal friezes placed on the jagati of the temple. However, in this temple, these panels are placed on the upper part of the parapet wall. This scheme allows usage of larger size panels. A connecting door leads a visitor to navaranga. The door is guarded by two dvarpalas on either side. The navaranga is divided into nine bays of equal size. It has thirty ceilings in overall and each has a dome exhibiting different designs. The central ceiling has two panels at its base, the lower row has Ganesha, Shiva, Kartikeya, Venugopala and Brahma. The upper panel has ashta-dikpalas on their respective locations. In the navaranga are placed images of Ganesha, Kartikeya, Saptamatrikas, Naga couple, Veerabhadra, Vishnu and Shiva. The tower of the temple is a seven story structure consisting of seven rows of indented square-shaped kirtimukhas. In each of these kirtimukhas are placed a form of Rudra. The top stone kalasa is no more there, it has been replaced with a metal kalasa. The tower projects over to sukanasi above which a Hoysala emblem is placed. This emblem depicts the fighting scene between Sala and a tiger. On the front kirtimukha over this sukanasi has a fine image of Shiva as Gajasamharamurti with sixteen hands and dancing over a head of an elephant. Accompanying him are Brahma, Vishnu, Nandi & Ganesha. The lintel of the sukanasi carries an image of dancing Shiva accompanied with Brahma and Vishnu. Inside the sanctum is a Shiva-linga. To the south of the main temple, at right angle, is a Sarasvati Temple. The image of the goddess Sarasvati is among one of her best representations in the Indian art as mentioned by various art historians. Signature of various sculptors are found, to name few, Mallitamma, Padumanna, Baluga, Malaya etc. Mallitamma was the most famous Hoysala artist and is by far the most prolific of all Hoysala sculptors. Many of his signed images have been found, from Amruthapura in the north and to Somanathapura in the south of the Hoysala empire. Image at Amruthapura is the earliest reference of Mallitamma. Collyer tells that the artistic career of Mallitamma spanned for great seventy-three years. Mysore Gazetteer mentions that Amritesvara Temple is one of the most ornamental temple erected during the reign of the Hoysala king Veera-Ballala II however it was almost in complete ruins. However this statement cannot be taken at its face value as the temple was not in complete ruins and as an evident we find this temple is good state of preservation at present times. Annual Report of the Mysore Archaeological Department for the year 1931. Government Press. Bangalore. Collyer, Kelleson (1990). The Hoysala Artists: Their Identity and Styles. Directorate of Archaeology and Museums. Mysore. Dhaky, M A (1974). The “Gothic” in Indian Temple Architecture published in East and West Vol. 24, No. ½.
Kamath, Suryanath U (1981). Chickamagalur District Gazetteer. The Government Press. Bangalore. Rao, C Hayavadana (1930). Mysore Gazetteer vol II Part I. The Government Press. Bangalore.